While it’s mostly fun in the sun these days, before you know it the chill of autumn and winter will be filling the air … and our homes. Before the dreary days and incliment weather start taking over seemingly every aspect of your life, now is the time to consider upgrading your floor heating system. 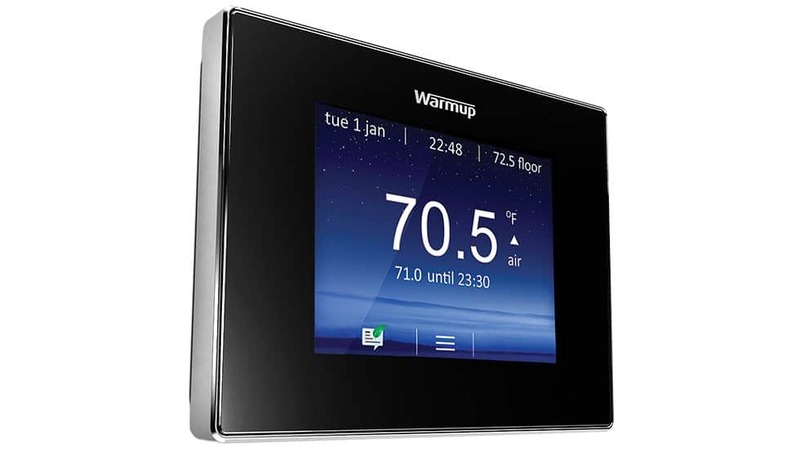 Warmup, the leading home floor heating system manufacturer, has recently announced their new 4iE Smart WiFi Thermostat and the MyHeating app for whole house comfort control, and we think it’s definitely worth checking out. The 4iE® was built so you wouldn’t have to touch it — most adjustments are made automatically via the self-learning and SmartGeo™ features. The 4iE’s self-learning features will adapt from your manual inputs and create a schedule. However, the real innovation lies in the SmartGeo™ capability, which uses your cell phone location to determine your specific heating needs. It will know whether you’re there or not, and whether you would like it warmer or not. Not only is it a dramatic shift in comfort, but it is a significant source of savings for the end-user. With SmartGeo, the 4iE® can control your heating automatically and reduces your heating usage by up to 25%. It works using the location services built into smartphones, as well as learning your routines and the most efficient settings for your home. So your heating is always at the right temperature, effortlessly. Your home is automatically warm as you arrive, and running efficiently when you’re away. Just like magic. Standard geo-fencing thermostats use the location services built into your phone to set a temperature based on how far away from home you are. The SmartGeo learns your routines, eventually knowing when you’re likely to leave and when you’re likely to come home. This means it can set lower, more efficient temperatures when you’re likely to be away for longer, even if you’re close by, and still be up to temperature just as you arrive. The 4iE® is designed to look great in both modern and traditionally styled homes, with high-gloss effect front faces, and beveled chrome edges to reflect wall colors. A range of vinyl overlays are available in bold colors and textured metal and wood effects. You can even use a custom photo to complement your wallpaper. The large color touchscreen can be customized with different themes and uploadable photo backgrounds. There’s even a 7-day local weather forecast built in. If just want to make a quick adjustment, the Natural Language Programming feature is simple to use. It uses familiar terms and phrases to understand the requirements for your heating program, such as ‘What time do you wake up?’ Your inputs then build a simple sentence that summarize your programming choices. The 4iE® is ideal for use with line voltage heating sources such as baseboards and electric underfloor heating systems, and is available through authorized flooring and electrical dealers.